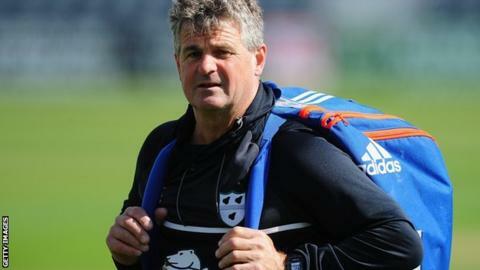 Director of cricket Steve Rhodes says Worcestershire have not given up hope of making the T20 Blast quarter-finals despite the odds being stacked against them reaching the knockout stages. The Rapids need to win their last group match at Derbyshire on Friday and hope both Durham and Yorkshire lose their final two games to make the last eight. "We haven't given up on this T20," Rhodes told BBC Hereford and Worcester. "There might still be a chance and there's a lot of pride to play for." Worcestershire began the competition by winning four of their first five games but then suffered five defeats in a row - including a club-record low total of 53 against Lancashire - to put their qualification for the quarter-finals in real doubt. A five-wicket win over local rivals Birmingham Bears ended that poor run but leaves them knowing only victory against Derbyshire will do. "We've come up against some decent teams who've played well and produced some special individual performances," Rhodes said. "We've had a few problems with the ball in keeping teams quiet in the power-plays - it's difficult to put your finger on it. "If we can win the last game and sneak in (to the quarter-finals) then possibly we're a bit lucky. What will be, will be, but we'll be giving it a good go." Worcestershire had pinned a lot of their T20 Blast hopes on the New Zealand all-rounder Mitchell Santner, but their overseas star's time at New Road was cut short by a finger injury in their first group game against Durham. "He would have been a terrific T20 player for us," said Rhodes. "He has three disciplines and does them all very well - I think that was a big blow to us."